Grondre Holiday Park0800 955 1122work Holiday, Touring & Camping ParkGrondre is a select holiday park oozing with real character and situated within the picturesque surrounding of an 18th century country manor house. Set away from busy roads and noisy towns, Grondre is well suited to families and couples who are looking to escape from it all and have a quiet, relaxing break. We are on the border between Pembrokeshire and Carmarthenshire - making us conveniently placed for visiting many 'must see' attractions with the breathtaking scenery and friendly atmosphere all combining to create a truly memorable holiday experience. Grondre is the ideal location to enjoy your next touring and camping holiday. There are a variety of different pitch types available that can accommodate touring caravans, motor homes, tents and trailer tents. 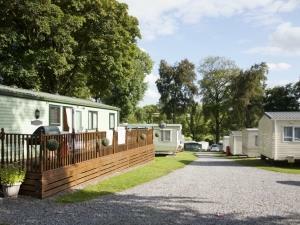 The Touring Park is situated in a secluded west facing field that offers stunning views of the Preseli Mountains. Grondre is a select holiday park oozing with real character and situated within the picturesque surrounding of an 18th century country manor house. All pitches are conveniently close to our modern toilet and shower facilities. Directly adjacent to the Touring Park, you will find our very own pub, 'The Stable Inn' and outdoor swimming pool. Accommodation Hire We have ?ve ranges of accommodation to choose from: The Grondre Annexe The Grondre Courtyards Bronze Caravan Silver Caravan Gold Carava Children welcome from any age.